Facebook Messenger finally adds diverse emojis! Facebook has started rolling out a more diverse set of emojis to its Messenger service on the web, iOS and Android. Facebook Messenger has always allowed you to use the diverse emoji offered via your smartphone or computer. Now, these diverse emojis are baked into Messenger. With the update, you’ll have access to over 1,500 new emojis — 100 of which were designed “to better reflect gender and skin tones” with gender-agnostic options and multi-colored emojis. Thanks to iOS, I’ve gotten used to seeing women as information desk workers, dancers, ballerinas and princesses. Meanwhile, iOS emojis depict men in roles like police officers and spies. 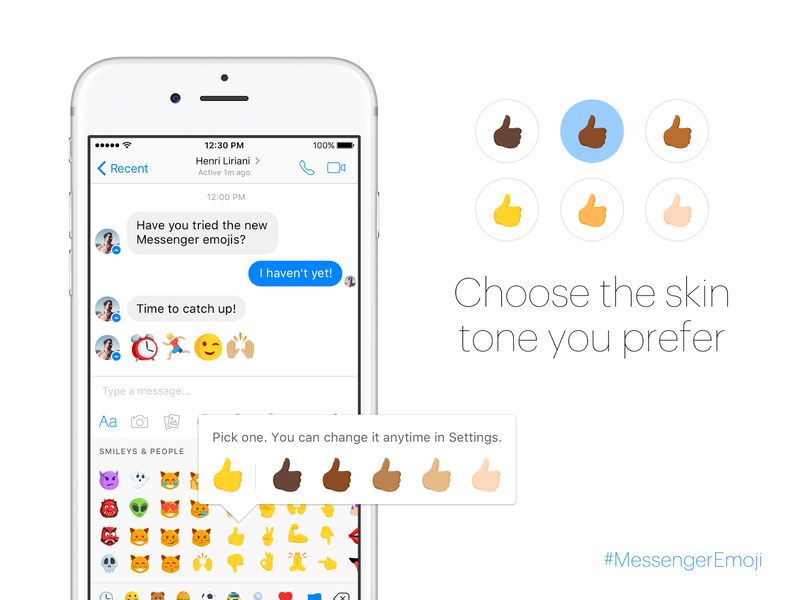 Also unlike iOS, Facebook Messenger will let you set the skin color you prefer your default emojis to be. You can, of course, change your skin tone anytime in the settings or do a long press on any emoji to toggle the skin tone. Depending on the emoji I’m using — and don’t ask why — I like to have a slightly darker skin tone. Last week, I noticed that Slack introduced a similar feature. My hope is that other platforms will follow suit. As it stands now, iOS does not have the option to select a default skin tone, but here’s the consolation prize: it remembers the skin tone you’ve previously selected for emojis you use often. Another significant aspect of this roll-out is the placement of emojis within the Messenger app. Before, regular emojis on Facebook Messenger’s web app were buried in the back. In the iOS app, I didn’t even see anything other than Stickers. Now, the Messenger composer will include an emoji picker located on the left side. Facebook is rolling out the update worldwide for every platform, including iOS and Android. Let us know what you think about the new emojis in the comments! JK, comments are the worst.